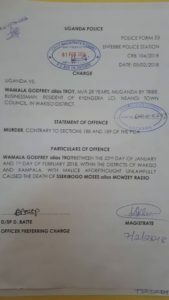 On Tuesday, February 6, Entebbe Chief Magistrate Mary Kaitesi remanded, until February 26, the main suspect in the late singer Moses Sekibogo aka Mowzey Radio’s death. 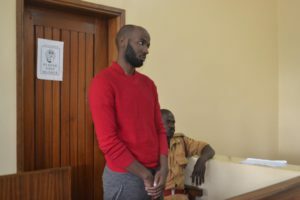 While remanding Godfrey Troy Wamala, Ms Kaitesi noted that the chief magistrate’s court didn’t have jurisdiction to hear capital offences like murder and the matter would be tried before the High Court, where Wamala would take plea. Prosecution led by state prosecutor Julius Tuhairwe told court that 28-year-old Godfrey Wamala, a businessman and resident of Kyengera LC1 Nsangi Town Council, in Wakiso District, between 22 January to 01 February, with malice aforethought, caused the death of Moses Sekibogo alias Singer Mowzey Radio which is contrary to Act 188 and 189 of the Penal Code Act. Mr Tuhairwe prayed for an adjournment into hearing of the case since inquiries into the matter were still ongoing. Police say they arrested Wamala in Kyengera, near Kampala where he was hiding at a friend’s home since the fateful night. When news of the brawl came through, media went awash with news of a bouncer at De Bar, a local night hangout in Entebbe, who had beaten up the popular musician in a brawl at the establishment. Several witnesses have come out to speak to the media and to police, pinning Wamala for having lifted Mowzey Radio, threw him on the floor, a throw that ended in the singer hitting his head down and cracking his skull. He was quickly rushed to hospital and operated on but he died days later. Wamala reportedly ran into hiding and was only found out days after Mowzey succumbed to the injuries he sustained in the brawl. Upon being arrested, Wamala has come out to say that much as he sat at the same table with the fallen singer that night, he never touched him contrary to what many witnesses have said. He claims he was also just told that the singer, while moving out of the bar had been involved in the brawl. De Bar manager George Egesa, in his statement to police says after the brawl, as Mowzey was being transported to hospital, he [Egesa] went to police to report the incident. At police, he and a friend, Xavier Rukere, who had escorted him were detained. “When I reached the entrance I found Mowzey had been taken to Emmanuel Hospital, and as the manager of the bar I decided to go to police and report that a fight had occurred at my premises and after doing so I was detained till today,” he narrates. Egesa denied claims that Wamala worked as a security personnel at the club. “Two days after my arrest Pamela [Mowzey Radio’s friend who invited him to De Bar] came to police and showed me the photo of that guy (Wamala), he is only a patron here, he even has unpaid bills at the bar,” he said. Wamala’s lawyer Ladislaus Rwakafuzi, in an interview with PML Daily, confirmed this saying his client had confided to him that he was only a reveller at De Bar and not a bouncer as is being reported and was only there to drink. He also refuted police reports that Wamala was arrested. “The police are telling lies the young man handed himself over to police at Katwe Police Station once he knew they were looking for him,” he said. Sources have intimated to PML Daily that in order to pin Wamala, De Bar manager Egesa and his friend Rukere who were the first suspects are to appear as State witnesses but not stand trial. According to Mr Allan Sserulika of Nsubuga, Mubiru and Co Advocates, it is the prerogative of the Director of Public Prosecution to charge a person in court basing on the evidence that the police has gathered against this person. “In this particular case, it is apparent that the only evidence available is eye witness testimonies and this is what the DPP has to rely on to try whoever it is that was involved in this brawl,” Mr Sserulika told PML Daily, adding that the DPP cannot prosecute a person without evidence. “It appears that Egesa’s participation was minimal in the brawl because even when you listen to those witnesses that have spoken, all of their statements exonerate the manager. Much as the statements were contradictory, which is normal under the circumstances, they seemed sober accounts of what transpired. They all say that Troy acted without the direct instruction from Egesa,” he says. Mr Sserulika says in this case if the DPP went ahead to prosecute Egesa even when statements exonerate him, this would turn into malicious prosecution. What this then means is that the DPP must turn Egesa to their side since this is the only evidence that can now be used to prosecute Wamala to any meaningful end. He adds that tempers of the public are high and for this matter police and the DPP must keep holding Egesa, but it is highly unlikely that any charges will be brought against him in court.